“Catching up” with Rob is hard to these days. In fact, I had fully planned on posting a combo review/interview of Andrew’s solo project “edu” by this point, but I’ve been too busy tracking the skyrocketing success of Rob’s solo endeavors over the last week. Even before I got a chance to write up a blog entry about the “Actual Cannibal Shia Labeouf” internet meme he created, I receive word of another huge project of Rob’s in the works. So, rightfully so, let’s first take care of the Shia business. Although, if you follow HITS on Facebook, Twitter, or Tumblr, I don’t need to tell you much at all. So I’ll keep this brief. 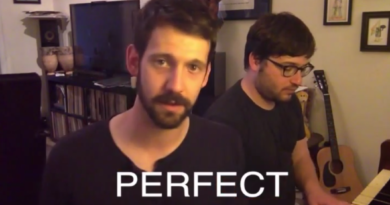 Rob, being the independent musician than he is, now that Tally Hall is on unofficial hiatus, put together an online portfolio of music he’s written. He uploaded songs to a SoundCloud profile and streams them through www.robcantor.com. But he didn’t say anything about it. So when it was brought to my attention by Billy Vaughn, I quickly posted a link on HITS’ Facebook & Twitter, and well… through a series of actions, he ended up being interviewed by The Washington Post, created an internet meme, and has been talked about on tons of music and humor blogs, big and small. I’m sure the craze is not close to over, either. You can read more about how it all happened on KnowYourMeme.com. But for those of us who are die-hard fanatics, we’ve also been wondering about the other songs on Rob’s portfolio. Today, we now know. Rob has been working with Rick Lax on a musical! Rick, being an author is penning the script, and Rob is writing the music and lyrics. Rick says they’ve always envisioned it being a web miniseries. So, when Amazon announced yesterday that it was beginning to accept proposals for original programming to be distributed via Amazon Instant Video, they uploaded everything they had. In every disaster movie, some guy bursts into the Oval Office and says, “Mr. President! There’s an asteroid headed directly for the earth!” This is that guy’s story. Calvert, our geeky hero, meets Kayla at an astronomy lecture. She misread a flyer and thought it was an astrology talk. Her mistake will prove to be the most devastating event in the course of human history. 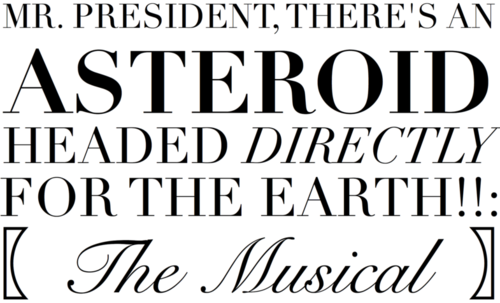 If you go to http://asteroidmusical.com (password:calvert) you can listen to the music as you read the script. But it’s important to download, rate, and comment on the Amazon project page if you wish to show Amazon your support of this project. Rick says Amazon may not get back to them for at least a month or two, so we probably won’t hear much more about this anytime soon. The Amazon page was removed. Hm. Yeah, I guess so.